1. 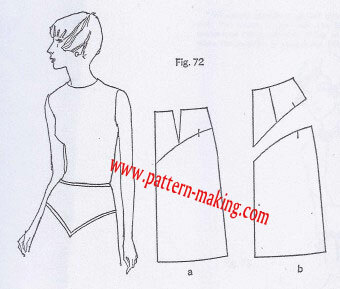 Trace the skirt-front sloper. Cut out the tracing and the dart. Z. Draw the style line of the yoke and notch it. Extend the waist¬line dart to the yoke style line (Fig. 72a). 3.. Cut the yoke away from the lower skirt. Close the extended dart (Fig. 72b). Note that the dart control appears in the seam that joins the yoke with the lower skirt. seam line of the hip yoke (Fig. 72b).